You can see where the bridge is buckled here. 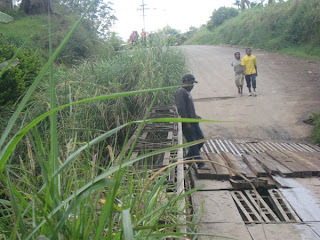 This is one of the main bridges on the road to our location. For a while now we haven't been able to send large trucks over it, as it's been slipping and breaking. So whenever we get a grocery supply truck to come, of a fuel supply truck, we park it in town, unload it into several smaller vehicles, and then bring the supplies in. This bridge is notorious for shredding tires, as you can see the light coming through there. You can see here why it might be chewing up tires... ragged steel sticking up all over. 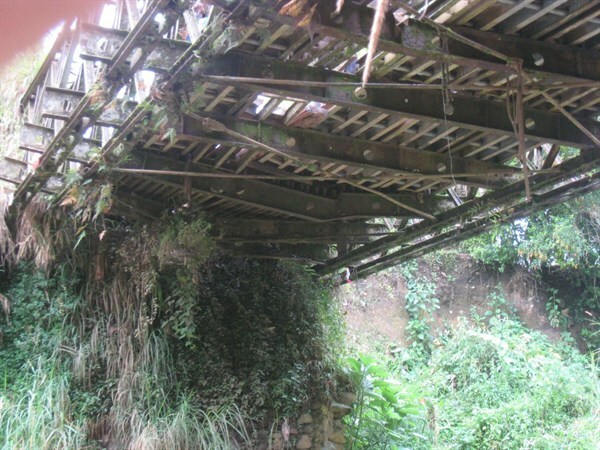 This bridge is not our property, but we have repaired it a few times. We have to weld the plates down well, because over time, people steal parts of the bridge. In this case, erosion, and weakened steal, and theft, have weakened the bridge to the point where we've known it would buckle any day now. The officials have been informed, and they in fact spent money and bought equipment to build a new bridge. The equipment is sitting in a town a few hours away, waiting to be assembled. You can see here the wood planks, which are a temporary fix for the bridge, although we have no idea how long before those planks go walkabout. The bridge finally buckled this week as a large coffee truck went over it. So now, we are cut off from supplies, as well as cut off from driving out. We can't drive out to the local commercial airport, or the towns where we can get food and fuel. So... today I am very thankful that we live where we do, because unlike a regional center, we can self-sustain for a few weeks while we wait for the bridge to get repaired. We have supplies of food, and fuel, and we have a local aviation department. So while a broken bridge is bad, it could be so much worse. Pray with us that it gets repaired well, and finally (not another temporary fix up job). We literally have been praying for months before crossing this bridge in hopes that it wouldn't buckle underneath us, before the officials in power replace the bridge. It would be a nice blessing to have this one thing not to worry about. And for those who swear we've talked about bridges before. Yes, there are 2 main bridges to where we are, but immeasurable bridges throughout the country that affect our work. This bridge I'm talking about here, is actually NOT the one we were praying about a few years back, that was another bridge. Both bridges are on the same road into town. So, if one goes, they might have well both have gone, but I'm very thankful that we only have to worry about 1 bridge at a time right now. Part of the experience of living here, is that you rarely drive off centre. You never do so just for leisure as each time you drive, you take your life into your hands, in multiple ways. On furlough we so enjoyed being able to jump into the car without much thought, drive 2 min down the road and have a place to eat, or get fuel! It was a bit of a culture shock that my wife was able to drive in a car, alone. It was liberating for sure, but still awkward at first. So for those of you who get to drive around and don't spend even a moment thinking 'is there a bridge between me and my goal? should I be driving alone? Does someone know where I am planning to go and how long it'll take me to be there?' Can you thank God for that freedom and maybe say a few seconds of prayer that our bridge get repaired? Thanks!! We do appreciate it!